Tonight's episode of Gotham, airing in just about two hours on the East Coast, features the return to the small screen of Victor Zsasz. 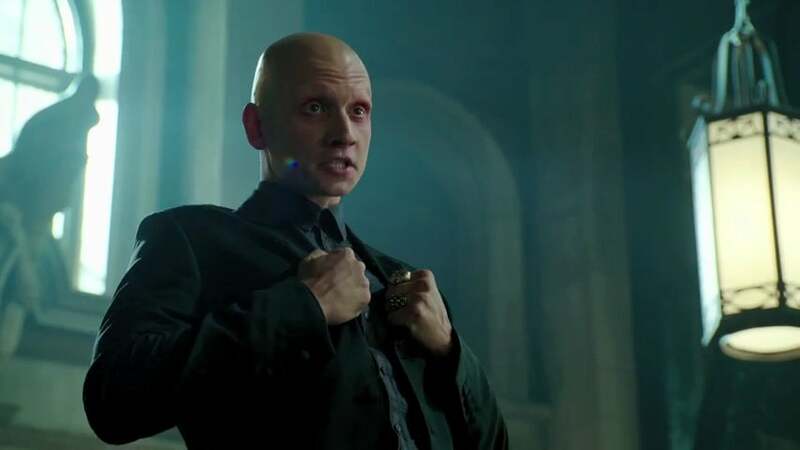 Played by former The Flash villain Anthony Carrigan, Zsasz is a serial killer known primarily in the comics for being covered in scores (literally) of scars denoting the victims he's killed. On Gotham, he memorably held court at the Gotham City Police Department, and then held Barbara Kean hostage, preventing Jim Gordon from either arresting Don Falcone or going out in a blaze of glory trying. This week, we'll see how he figures into a story that revolves around a prison break at Arkham Asylum, where The Electrocutioner and Amygdala are being pursued by Gordon as well as the rest of the team who are still on the force despite Jim being busted down to guarding Arkham. Carrigan joined us to talk about the role, expanding from "monster of the week" to recurring threat and joining the talented cast of the hit FOX drama. Is it kind of cool to be the first "monster of the week" type of villain (with The Electrocutioner) to recur? It's been a blast. I've had so much fun creating this character and it's been great to just be the psychotic button man who emerges from the shadows, does his job and then retreats back in the shadows. It's fun to be a really terrifying villain in Gotham because Gotham is a pretty scary place. It's been so much fun and to be joining such an amazing cast has been just wonderful. Zsasz doesn't have a ton of development in the comics, but he is really beloved by fans. Is it nice to know you can put your spin on a character like that? Yeah. I think that's the thing about all these different incarnations of the Batman legacy. That's what keeps it exciting is to allow room for interpretation and different possibilities. I've definitely drawn from both the source material of the comic books and also from what I want to be doing, from what I really appreciate about Victor and who I think he is. I think the more genuine and honest I can make that, the more it will be serving the story. You've incorporated a sense of class that I don't see from him in the comics. Do you think that's something that just works better on film? I think it's easy to fall into the stereotype of psychotic villains and making crazy faces. I think what's even scarier is creating that schism of, you never quite know who this person is. I definitely can appreciate that dichotomy of being both measured and volatile. I see him as nervous, but also very smooth. He's psychotic, but he's slick at the same time. And from the backstory, I knew that he was very wealthy, so he is classy but that doesn't in any way lose the psychotic element to it. He's a hard one to pin down and I think the mystery is also what's quite terrifying about him. Is there anybody from the cast that you really look forward to working with, or to getting more screen time down the road? Well, you know, honestly it's such a well-rounded cast. Everyone is so much fun to watch that it would be really hard to play favorites. The way I see it is, how would Victor interact with this person? How would Victor interact with this person? How quickly would Victor try to kill this person, and how would he try to get something from this person? I think just playing that game in itself is really fun. I'm interested to see how he's going to interact with the other villains who are establishing themselves as well and what their dynamics are going to be. I think it's really interesting when two villains who are equally eccentric meet...and there's a lot of eccentricity on the show. When you're watching the show, what do you take away from it? There are certain actors who go very broad on Gotham and some who don't, and somehow they all fit into this world. Right. I think the world of Gotham is a stylized world for sure, but it's also really gritty. You see elements of both of those things. There are different performances but I think they're all contributing to the creation of this world. And yeah, to that style that's being cultivated. Obviously Gotham is a show where you're surrounded by eccentric characters. Zsasz is a really dangerous character; how do you get across that your crazy is different than the other crazy? That's a good question. I think what's fun about doing more than one episode is you get the opportunity to, at times, just live in the crazy and let yourself go there but at times let yourself be completely normal because when you're not sure what exactly is going through this person's head, that's what's really creepy. It's like, is this really just a really nice guy who knows what he's doing and has a reason for it? Or is he completely out of his mind and cannot be trusted to be ten feet near anyone else? Often in a superhero show, the villain is less powerful and so he's trying to assert himself. In Gotham, you guys have all the power because the system is so corrupt. Is there a difference in how you play that? I think it's both. I think Victor knows how dangerous he is and how dangerous he can be so he has no problem walking in and asserting himself in the Gotham City Police Department but you have to keep in mind that there is a hierarchy of crime and Victor wants to climb that as well. So on the one hand, he's going to assert himself but on the other hand, he has to prove himself as well.